It is almost 2016. And now responsive/ fluid design became very trendy things for websites/ blogs. Not only trendy but it is very necessary for websites to have responsive design, as high percentage of users going mobile. Custom jQuery Mobile for mobile devices compatibility. 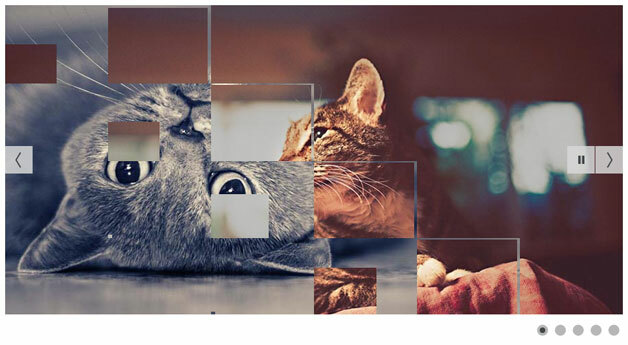 There is many beautiful jQuery slider/ slideshow plugin out there. But I found that most of them (slider with lots of features) aren’t fully responsive. Another dependable responsive slider I found is FlexSlider, which is very popular for its simplicity. Alongside responsiveness this Camera Slideshow plugin has some other cool features too including..
Play/Pause, Thumbnail Navigation, ToolTip Navigation etc. HTML5 Data Attribute supported. By using it, many properties can be added to slide. For example a link/URL, thumbnail URL/ slider image URL etc. You don’t have to worry about image size or aspect ratio. Images will be re-sized to fit automatically with the slideshow box. When images are larger than container / slideshow box, or have different aspect ratio then they will be cropped (from middle) automatically with maintaining their aspect ratio, that’s mean they won’t get Stretch. I recommend to add larger images than the container/slideshow box or at least same size of the container. Copy the code below and paste on it. Then Save it. And you’re done!. Look at the code below. This is where you customize the slideshow. Play with it. (Read code comments for get easily). The slider is beautiful. Lots of transition effects. Love it. Now it appears on the desktop but it does not appear on mobile. How to make it appear on mobiles too? PS: Yes I added as a widgets, so I have included "mobile='yes'" in the template code. Nice article, But how do i change the Image? and i adjusted the height of the slider so the caption did not adjust with it. Please what do i do? Changing images are quite easy. I'll show you. Yo'll see that data-src is containing image URL for every slide. And if you want to show thumbnails like shown in this demo(slider with thumbnails) then put your thumbnails url into data-thumb=""
awesome slider! For all that cant change the image just open the html and change the things that say "HERE" to your own images. @¡CHIVAS A GANAR!, You did great. There is nothing wrong with your installation but jQuery conflict is causing the trouble. Your blog has now two jQuery script. All you have to do is remove one. And that's it. But if you still have that problem or anything else, let me know. It is quite impossible for me to say whats causing the bug there without seing/investigating the whole code (template). Thanks! I'll send you the code template. I'll email it to you. Can you put the widget directly into the home page? Thanks! Hello! I find it impossible to replace with my own pictures..! Blogger Dynamic Slider is the only slider which has that functionality to update slider images from new posts or from a selected Label. Currently this slider does not have that. I’ll think about adding this option to it next. Thanks for visiting. Thanks for the best one ever....i want to ask how to add link for image article below the image???? Beautiful slider and easy to customize! Thank you! is it only for blogspot or custom domain can use it too? Great slider! Everything is working good, however I would like the slider to only display on the home page. Do you have a fix, preferably CSS for that? How do I remove the captions of my images during the slideshow? hello . excelent widget but i face 2 problems. can you help me ? secondly the dots ( that move through the slides) are supposed to appear lower and not that hight with result of a white space below the widget. I had slideshows on my blog earlier but suddenly disappeared. I tried following your directives to get it restored but it didn't work, instead, it is showing details on 'Camera responsive/adaptive slideshow'. I earlier had a slideshow which I uploaded images from PC and not from camera. Please, how do I get it restored? how to make the box of images be lager ? But the slicer works fine except one thing. My images are of different sizes. So now most of them does not fit in the window. This is for me the last finish touch to make it work! By the way, is there any easy way to show the pictures randomly? I guess I will need to code to modify this but maybe there's an easy way I don't see. Thanks in advance! I was using this slider for a couple of days in my blog. I had to add i more slider to the blog that I got from another source. When I installed the second widget slider , i found that this slider donor work. When I removed the second slider this one is working properly. Please help me to sort this. how to change the pictures with auto slide recent post? It supports captions, HTML elements and videos." Thanks a lot, your sliders are very easy to apply. Just one second to customize and voila!. The slide is simply awesome. Here you can have a look: Blog de cerveza artesana..
Could it be possible to show it just in the main page? Anyway to remove the navigation arrows and remove auto rotation of images? Would rather users just click the thumbs. Hi, the slider is simply awesome. I have a question, could it be possible to make it works inside a post instead a widget? Thank you, this was very generous and helpful!! Thanks for this article, i used it on my site and i like it.